This Southern Indian breakfast recipe of Semiya Upma made with a squeeze of lemon to it, is a refreshingly hearty way to start the day with. Upma is a very traditional South Indian breakfast meal, made with vermicelli, semolina or flattened rice flakes (aval). For those who are not very familiar with upma, the closest preparation I can think of to this one is polenta, but a lot drier than that with no leftover water or liquid in it. The semolina variety is the most common one in upmas, though the others are also very often made. 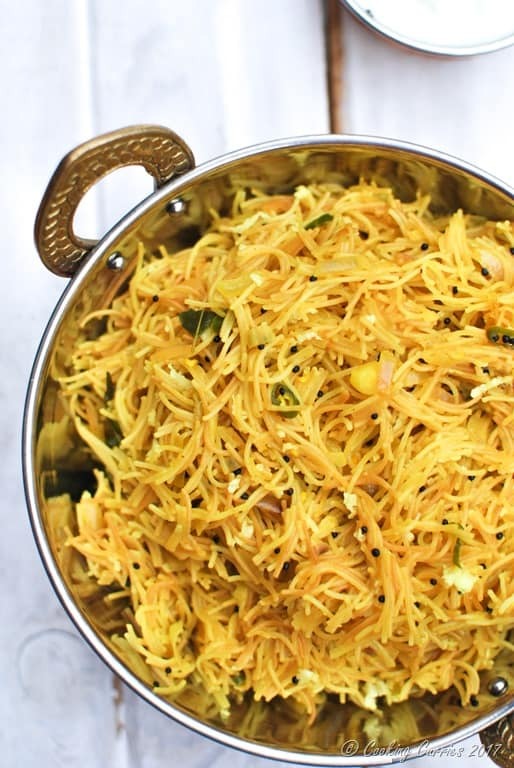 I have been making this lemon vermicelli upma a lot these days. The regular vermicelli upma does not have lemon in it, this is a variant of it. Not only is this upma easy to make for a weekend breakfast / brunch, but it is also so very tasty and different from the regular vermicelli or semolina upma. The squeeze of lemon adds that extra special tanginess which elevates the flavors to whole different level altogether. You can buy vermicelli in different forms. Either as long noodles, which you then break into 1/2 inch long pieces with your hands, which can sometimes be a little painful and fun at the same time. Or you can buy it already broken into small pieces. Even in this, you get the roasted version and the not roasted version. If you buy the plain one, make sure you dry roast them in a pan, till it is golden brown in color like in the picture above. If you love this recipe and want more Upma recipes, here are some on Cooking Curries – Bread Upma, Vegetable Rawa Upma (Vegetable Semolina Upma) or Oatmeal Breakfast Poha. Heat the oil in a sauté pan. Add the mustard seeds and let is splutter. Now add the curry leaves, give it a quick stir and add the onions and chopped up green chillies. Once the onions start becoming translucent, you don’t have to let them turn brown, add the water and salt. Bring the water to a boil. Note, that this will be the time to check the salt. If you taste the water, you will approximately know whether the salt is enough or not. You will not be able to add salt to the noodles later. Now add the roasted vermicelli, reduce the heat and let it cook and absorb all the water. 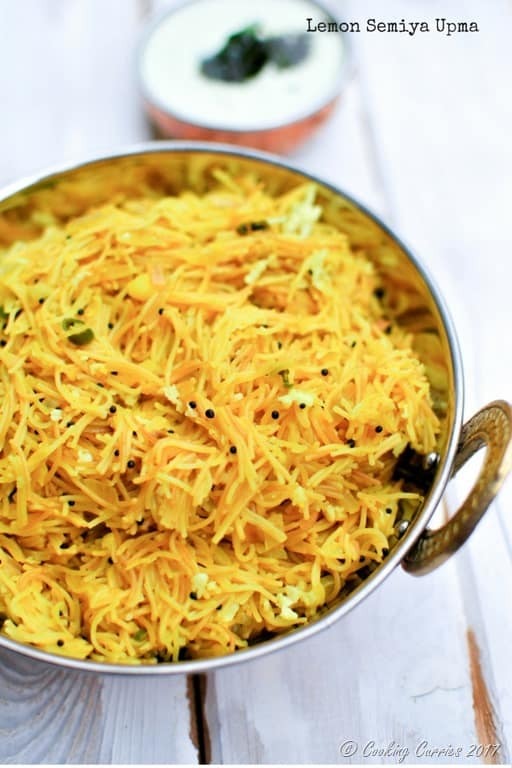 Once it starts looking like cooked noodles, stir well, add the lemon juice and the grated coconut. Give it a quick stir again. Remove from heat. Serve hot with coconut chutney or any other chutney of your choice along with some piping hot South Indian style filter coffee. 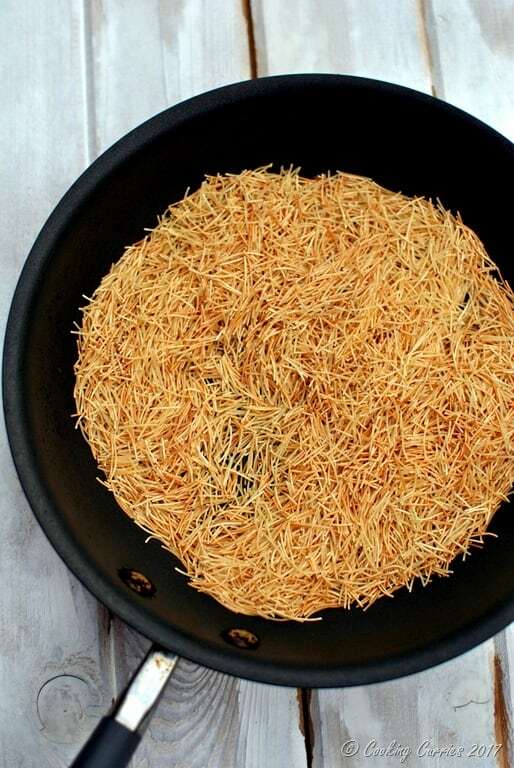 The vermicelli used it what you get in Indian stores, also called semiya. It is made with wheat. So this is not suitable for a Gluten Free diet. You can substitite with rice vermicelli. 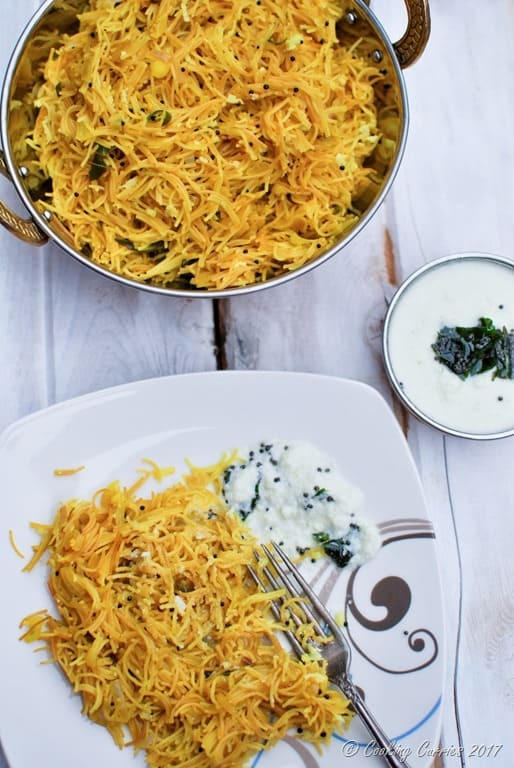 Though it is called a different dish - Rice Sevai Upma, in Southern India, it is still tasty. I will update the recipe link here, when I post it.